Like a good mystery novel, the world of business involves drama and suspense – not to mention a never-ending supply of red herrings. Taking the Mystery out of Business simplifies a complex subject, showing readers how to identify the killer aspects of the business world and dodge bullets that could inflict fatal wounds. Business owners, independent contractors, managers, and employees often wear many hats and deal with limited time, budgets, and resources. 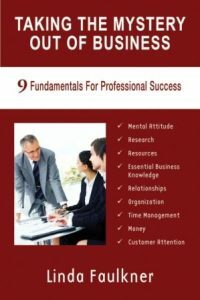 In this practical primer, Linda McHenry (writing as Linda Faulkner) lays out the fundamentals, providing examples and tips so newcomers to the business world can easily gain an understanding of the challenges they face. Experienced professionals will benefit from a refresher on basic strategies and how to stay ahead of the competition. Starting with attitude and covering everything from money management to customer attention, Taking the Mystery Out of Business is a resource for entrepreneurs, employees, and anyone who has questions about the often mysterious world of business.